Salima North West legislator Jessie Kabwila will represent her new party UTM in the May 21 Tripartite Elections as she went unopposed during the primary elections on Tuesday after dumping main opposition Malaei Congress Party (MCP). Kabwila went unopposed after her challenger , Moses Bowa, withdrew his candidature . The outspoken legislator clarified that that she did lose the MCP primary elections but that she did not participate. "Those were not primaries but an ambush. It is well-documented. Twice they attempted to set this up but they failed because I was just too strong for them on the ground. My competitor could not beat me in a free and fair election and that is why they used short cuts against the normal MCP procedures to simply endorse him in the end," said Kabwila. She said people in her constituency want to align themselves with UTM Party president, who is also the country's Vice-President, Saulos Chilima, who has a passion to liberate them from poverty and hunger they have been facing for too long in the district. Kabwila vowed to ensure that UTM gets all parliamentary and local government seats in Salima. "Now that I have won the primaries. 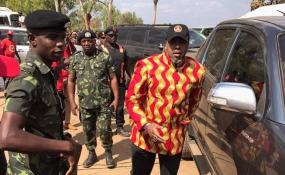 I will fight hard to ensure that Chilima gets all the votes in the constituency," she said. UTM is planning ti hold a rally in Kabwila's constituency on Saturday to welcome her . Meanwhile, UTM is yet to conduct primaries in Salima South West and Salima South.